Oil on panel: 19 1/2 x 20 1/4 in. 49.5 x 51.5 cm. 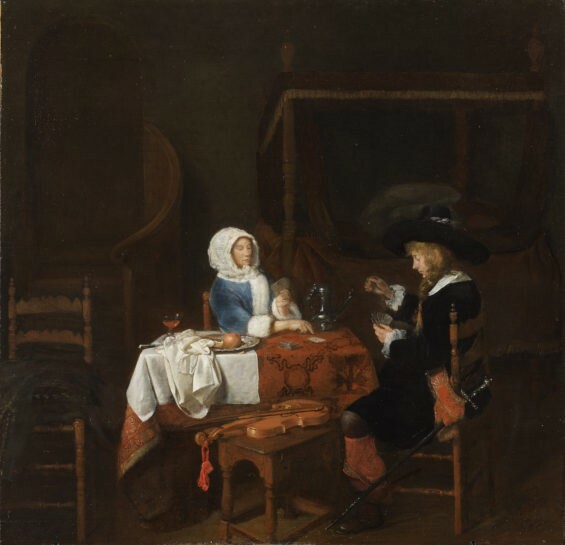 Although traditionally accepted as a work by Gabriel Metsu when it belonged to the Cook Collection at Doughty House, this panel has recently been re-attributed to Joost van Geel by Adriaan Waiboer of the National Gallery of Ireland, Dublin. Dr.Waiboer curated the Gallery’s 2010 exhibition devoted to Metsu, and has kindly pointed out that Van Geel’s paintings have frequently been subsumed into the Metsu oeuvre on account of their subject matter and stylistic similarity. Van Geel was a widely travelled painter who visited France, England and Germany before settling in Rotterdam and specialising in genre scenes of card players and musicians, although he also executed marines and rather indifferent portraits. His interiors, however, reveal him to be a close follower of Metsu, and the quality of his work is close enough to Metsu’s to be mistaken for the master’s. He shares Metsu’s focus on richly attired ladies wearing hooded gowns trimmed in white fur. Such women appear in Van Geel’s Mother with Nurse and Child in the Boymans-van Beuningen Museum, Rotterdam, and constitutes the second figure in the present Card Players. They look downward, with heavily accented eyelashes. Elsewhere in our work the artist reveals himself to be a virtuoso of still-life painting, in such details as the carpeted table set with fruit, and the foreground violin resting on the stool. The narrative of the scene is a familiar theme of Dutch 17th.century painting. A dimly lit staircase in the left background leads down to the scene at the table. The usual accessories of seduction – wine, fruit and music, expressed in the beautifully rendered violin resting on the stool, summarise the love interest of the elegantly attired cavalier, and despite the demure expression of the be-furred lady who appears to have played her ace card, we are left in little doubt that the story will end in the elaborate bed behind. Dr.Waiboer has kindly drawn attention to two similar works by Joost van Geel, one in the Nationalmuseum in Stockholm, and another which was with Sotheby’s in 2008. I am writing to enquire about "The Card Players"